Guinea pigs make family-friendly pets, are easily bred by even novice owners. With proper care, guinea pigs can live to be 5 to 7 years old. Young pigs are usually sold in pet stores, but their ages are not usually documented. While there are no ways to determine an exact age of a guinea pig short of a medical exam, a few factors that come into play can give you a rough idea. A young guinea pig is born with a small set of developed teeth that initially appear white and continue to grow throughout his life. As the guinea pig ages, teeth will yellow, develop ridges and sometimes break. The animal needs the abrasive silicates found in grass hay to help wear down the teeth throughout his life. 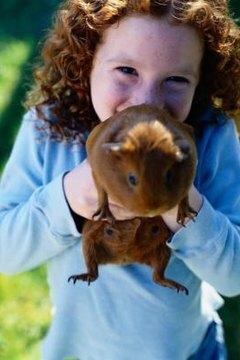 Healthy young guinea pigs will weigh around 18 ounces by the time they are 3 months old and will grow to between 24 and 42 ounces by 1 year. The hind ends of guinea pigs spread as they age, particularly in females who have given birth. Testicles will become visible on males by 6 weeks old.